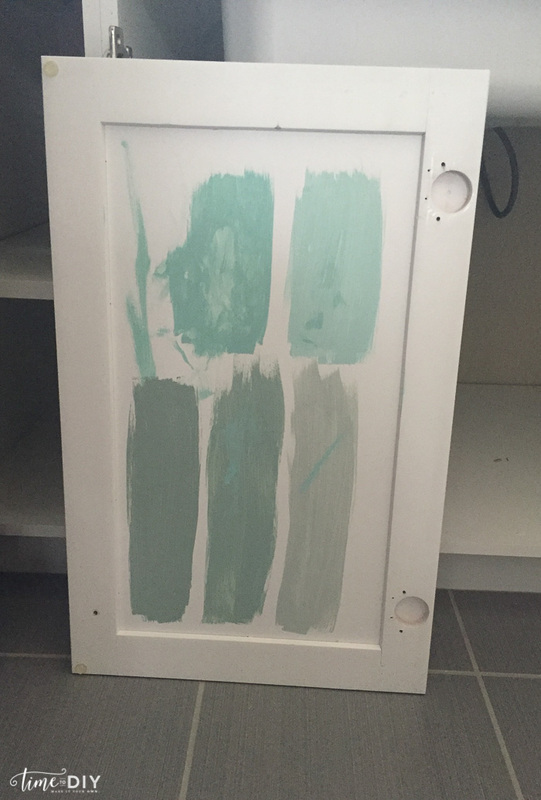 This week I’ve been painting my laundry room cabinets. 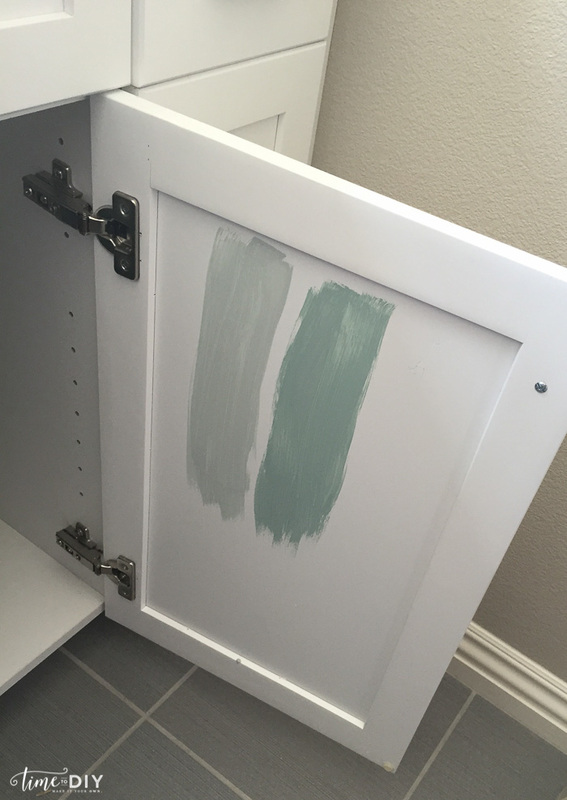 Our builder would only allow the same color cabinet throughout our house so this won’t be my last cabinet painting project, and I figured the laundry room would be a great low-pressure place to start! And a good place to have a little fun with some color, what do you think? 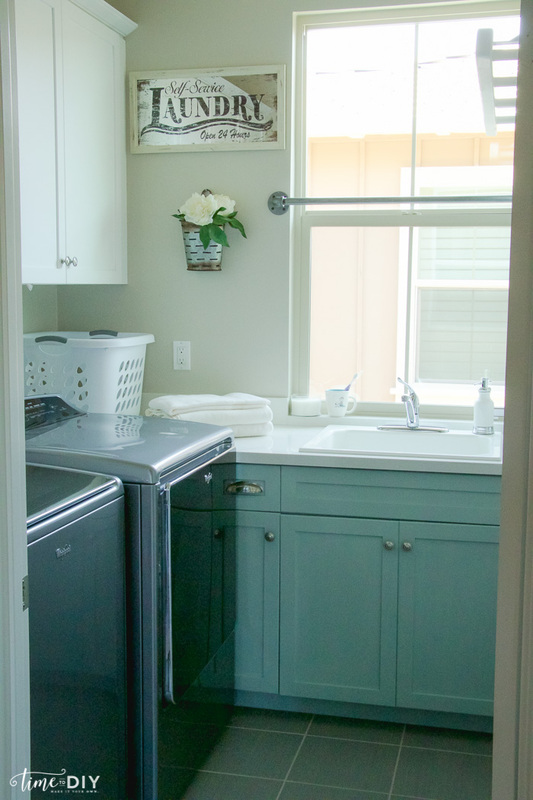 The white is nice, and I usually prefer that, but I wanted to have a little fun in the laundry room. Anything to help motivate me to do laundry, right? 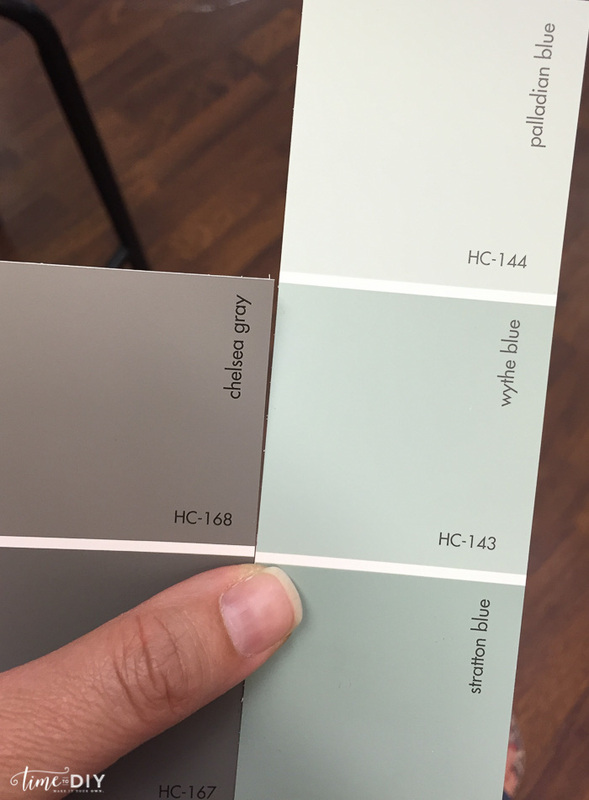 The first, arduous step (for indecisive people like me) was choosing a paint color. 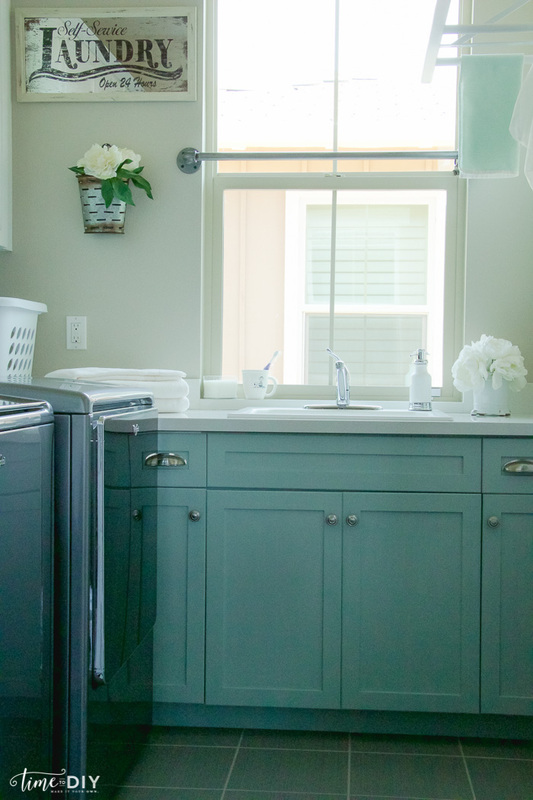 I have a crush on Erin’s from Sunny Side Up Blog laundry room. 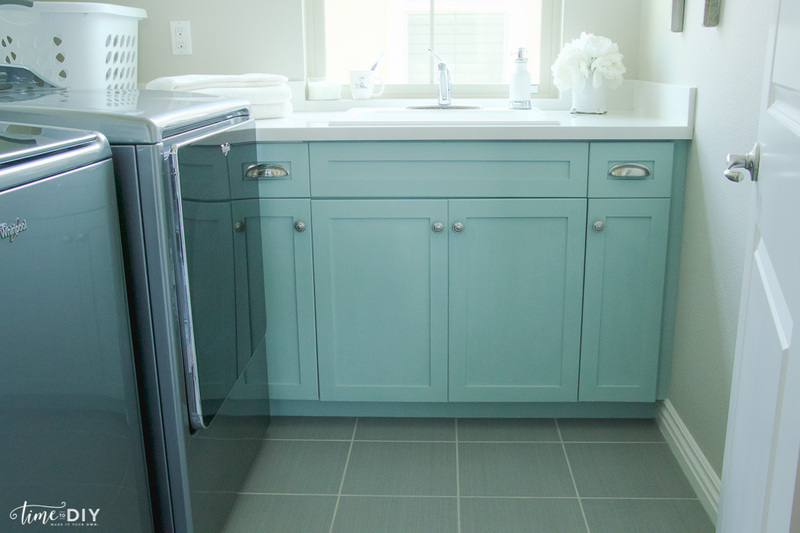 Her cabinets are painted with Benjamin Moore Wythe Blue. 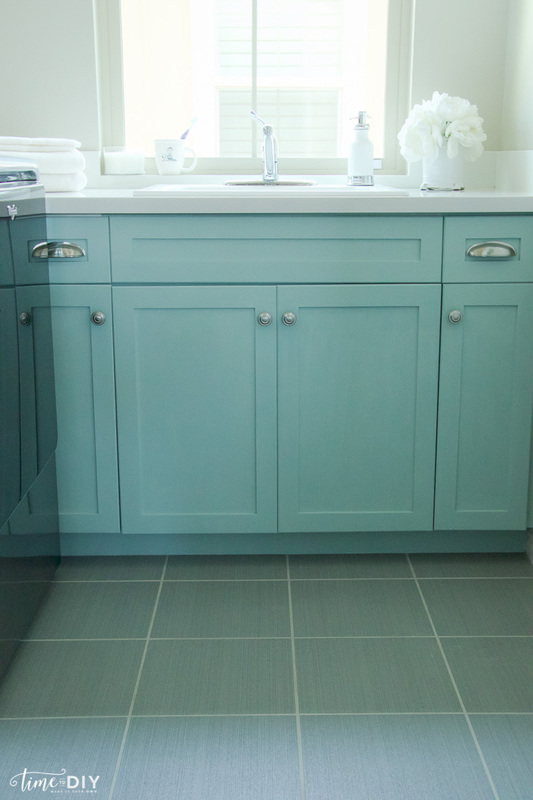 I liked that it went well with Chelsea Gray, which I would like to use in the bathrooms. But instead of just going with that color, because that would just be too easy, I pulled some other samples, just to make sure. My 2 year old was “helping” with the samples painting, hehe. Some were way too bright, so I narrowed it back down to the Wythe and Palladian Blue, and ultimately decided that Palladian was too light. I was back to where I started, yes, but at least I wouldn’t question my decision later! 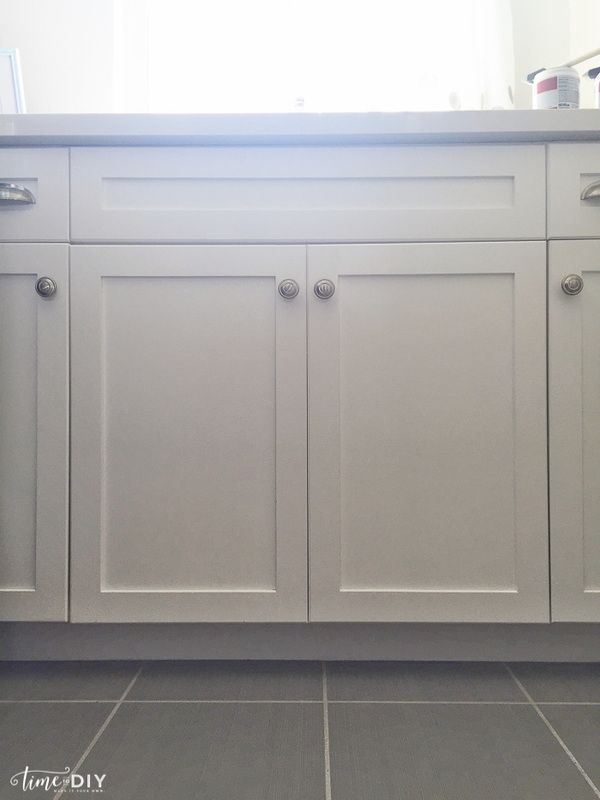 Painting the cabinets wasn’t as hard as I thought because when you remove the panels, at least in my laundry room, there isn’t much left to paint! It was just the tedious work of painting the panels front and back. Not terrible though. 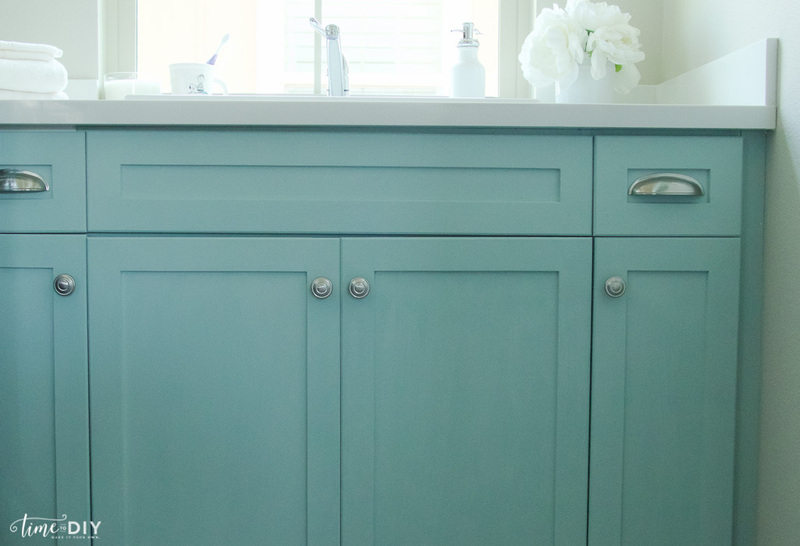 As I typically do when I paint furniture, I mixed the paint with some BB Frosch chalk paint powder, and I painted everything with about 10 ounces of paint. 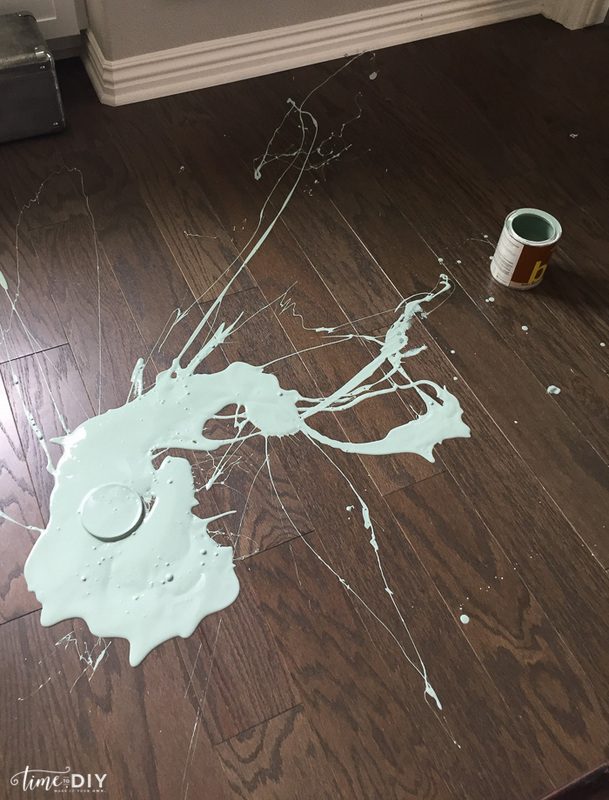 I did have a moment when I was deep in thought and accidentally shook the quart when the lid wasn’t all the way on. Oops! 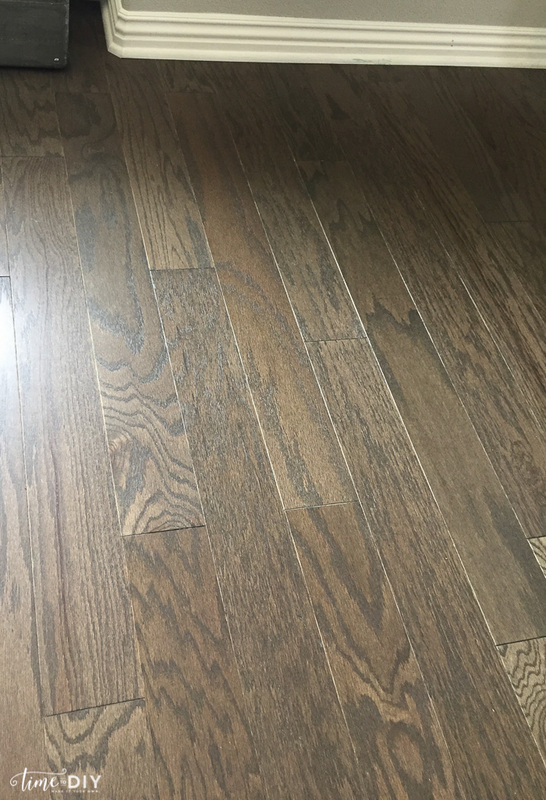 But at least it’s wood floor and cleaned up well! 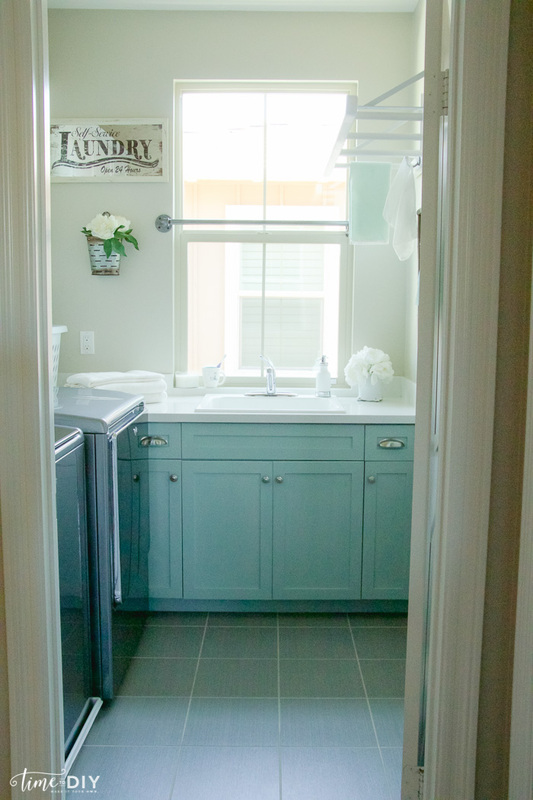 I still have some light sanding to do to smooth it out, and I need to wax them, but I put them back up and I am very happy with the color and how it brightens up my laundry room! I use toothbrushes for stain removal, in case you’re wondering why a toothbrush is in a mug on the counter. Just keeping it real. 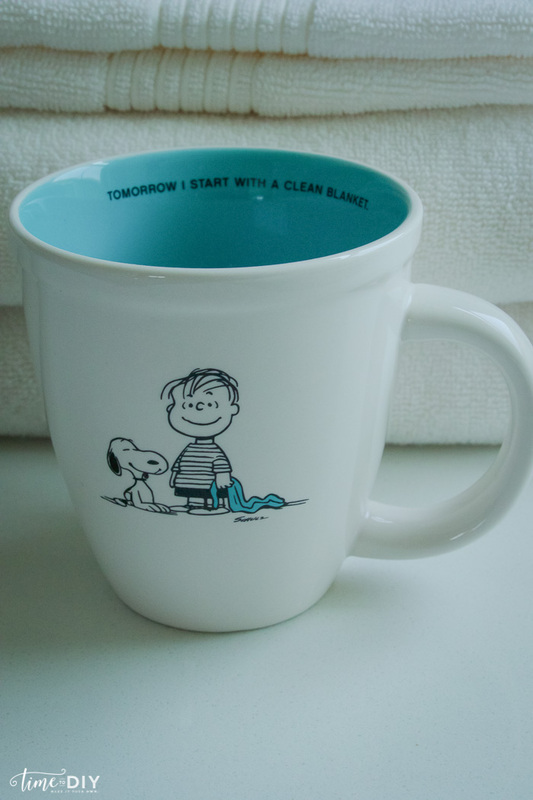 And it’s in one of my favorite mugs. That Linus, gotta love his perspective! 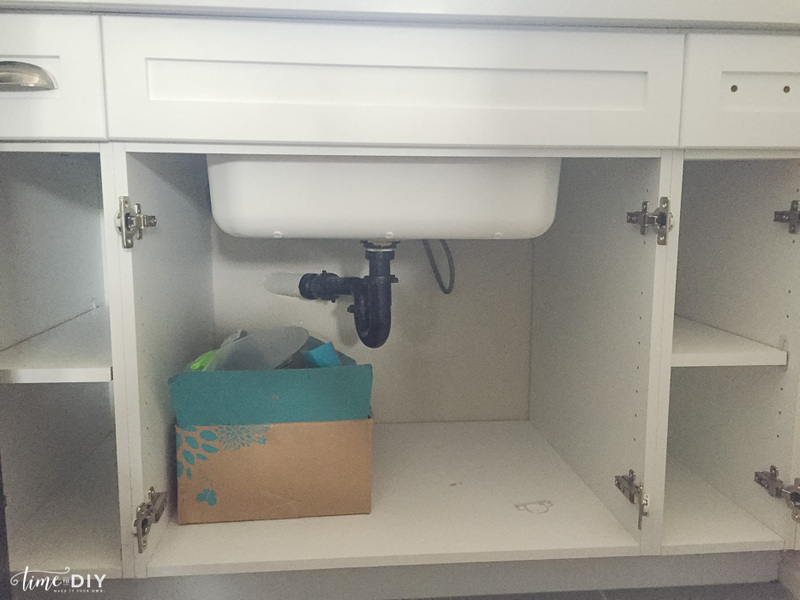 My “new” cabinets go nicely with my DIY ladder, don’t you think? Thank you! We are building and this is the vision I have and now I know it’s possible. Looks beautiful. I too have a toothbrush in my laundry. Oh, fun! Good luck on your build! I wish I could do it a second round to get everything right, haha! Toothbrushes are the best! 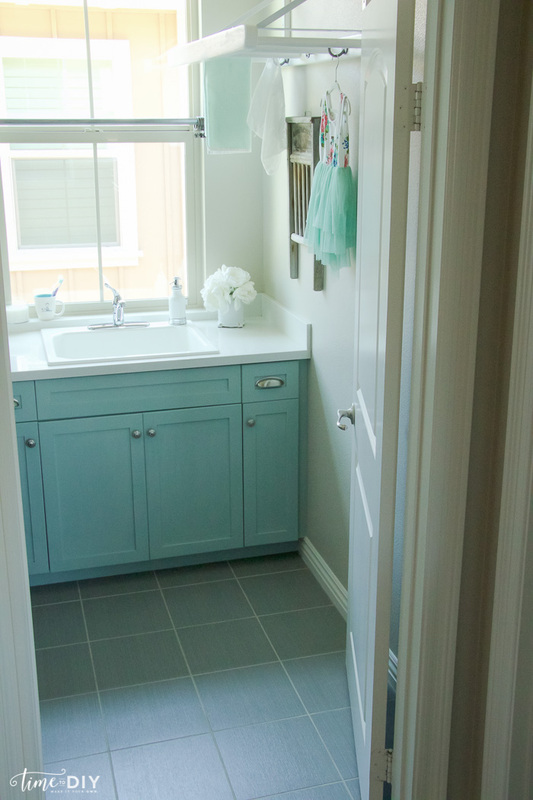 They are just builder grade cabinets (I actually wouldn’t recommend the carpenter they used) and I painted them. what wax did you use after painting? Hi Kim! I love the BB Frosch clear wax! It’s not as smelly and easier to apply. Looks beautiful! Where did you find the “Laundrey” sign?